Combining history and hardship, battles and betrayal, miraculous escapes and death-defying encounters, From Exile to Eden chronicles one family�s journey from deportation in Siberia to safety and freedom in America. On February 10, 1940, the Szelazek family was deported as prisoners of war from Poland to a Soviet labor camp in Siberia, beginning a 12-year epic journey that spanned countries and continents. 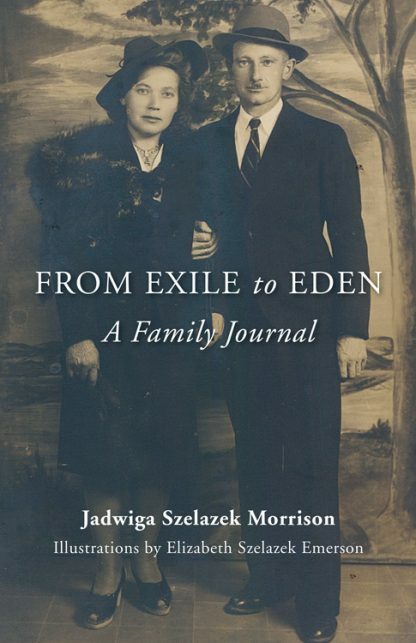 In From Exile to Eden, Jadwiga Szelazek Morrison traces her family�s harrowing yet inspirational flight from war-torn Europe beginning with two remarkable people�Tadeusz Szelazek born in 1909 to a titled family of the old Polish aristocracy and Helena Semerylo born on Armistice Day 1918. Tadeusz and Helena create an unforgettable story of love, loyalty, courage, and inspiration. Helena, destined to be unusual from the moment of her birth, discovers her psychic awakening at the age of five when she is struck by lightning, followed by a second lightning strike as a teenager. Her abilities prove to be both a blessing and a curse for her and her family, and lead her on a journey to distant lands far from the land of her birth. Tadeusz follows a path of intellectual pursuits trying to unravel the meaning of life, in the end finding answers only within himself and from those he loves. A chance encounter with a world-renowned seer, leaves him in possession of predictions concerning his future. With logic and intellect battling the possibilities of predestination, he finds his life unfolding in patterns which he fights to control and change. Drawn from memoirs and family journals, From Exile to Eden weaves history, adventure, romance, parapsychology, and inspiration; sharing the story of the Szelazeks� exile as political war prisoners, their battles with disease, hardship, betrayal, death, and struggles for freedom throughout Russia, Europe, and the Middle East. The many miraculous escapes, death-defying encounters on the battle field, personal encounters with famous political figures, and numerous paranormal incidents will keep readers on the edge of their seats. Jadwiga Morrison, or Jadzia (Yah-Jah) for short, lives in Burlington, Connecticut where she teaches in the Special Services Department of the regional high school. She received her Liberal Arts degree in English from Central Connecticut State University with a minor in History. After living in Hawaii for a number of years, she returned to Connecticut where she has been writing and working on various literary projects including From Exile to Eden and This Life of Mine, is a book of illustrated poetry inspired by real-life truths. Jadwiga is also a certified Transpersonal Hypnotherapist (CHt) specializing in helping people with various compulsions, phobias, bad habits, and learning disabilities. Jadwiga has a great love for horticulture and raises many unusual varieties and species of orchids and tropical plants. Her interests in home construction and landscaping are evident in her newly renovated and restored 1920�s home in Connecticut (an original Sears Honor Built Catalog Home). Some of her other interests include archaeology, travel, music, arts & crafts, cooking, psychology, reading, and metaphysical studies.